When you're craving Chinese food, you don't have to order takeout. This sesame chicken is easy to make and it's just as quick as having it delivered—only far fresher. A little bit salty, a little bit sweet, and a touch nutty, the chicken is cooked to a golden brown finish. Just add broccoli and rice, and dinner is served in 30 minutes, start-to-finish. The beauty of this dish is that it takes only simple ingredients that are easy to stock. 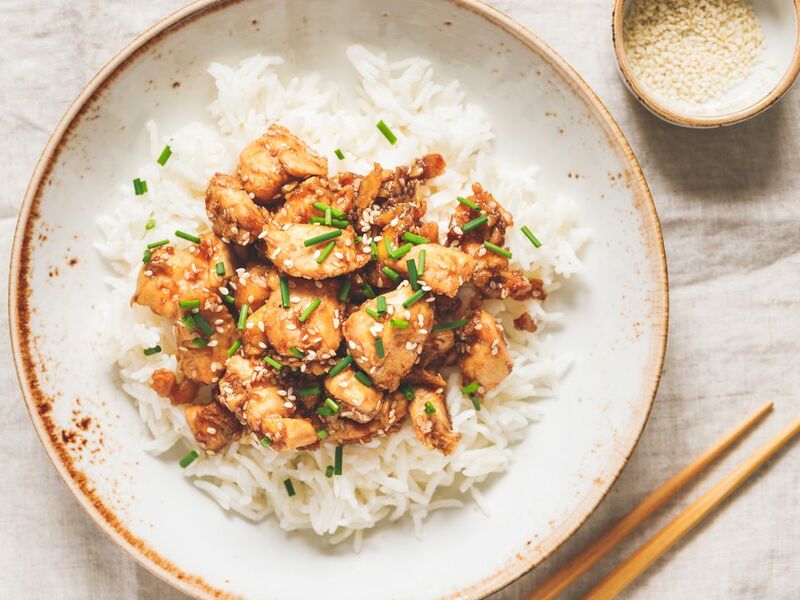 While the typical restaurant version is deep fried, your skillet sesame chicken will use less oil. Sesame oil has a similar nutritional content to olive oil. Both are low in saturated fat and high in monounsaturated fat. Sesame oil is higher in beneficial omega-3 fatty acids than olive oil. Sesame seeds provide beneficial fiber and minerals. To make the stir-fry sauce, whisk together the brown sugar, soy sauce, sesame seeds, and garlic in a bowl. Next, in another bowl, whisk together the egg and cornstarch. Add the chopped chicken breasts to the egg and cornstarch mixture and stir to coat. Warm the sesame oil in a skillet over medium-high heat. Add the coated chicken and stir-fry until it’s lightly browned and cooked through; then turn the heat down to medium-low. Give the sauce a quick stir and add it to the skillet with the chicken. Stir-fry for about 5 minutes, until the sauce evenly coats the chicken and is thickened. Serve over rice with some steamed broccoli, additional toasted sesame seeds, and scallions for garnish. If you prefer, you can add steamed broccoli florets to the skillet just before you add the sauce and cook them with the sauce and chicken. Sesame seeds are everywhere, and you may not have stopped to wonder where they come from. They are actually an ancient oilseed that has been grown for over 3000 years in Africa, Mesopotamia, India, and Asia. Historians believe it may be the oldest oilseed grown by humans. The plant is an annual that grows 2 to 3 feet tall and thrives even in dry climates. The seed grows in pods that look a lot like okra. The phrase "open sesame" comes from the fact that the pods burst open when ripe, releasing the seeds. The plants are harvested by hand and allowed to dry until the pods have all opened. The seeds are hulled, resulting in the tiny white seeds you are used to seeing. To bring out the best nutty flavor, the seeds are then toasted. What Is Dr. Baker's Original Cornell Chicken?